Last year I decided to take some time off work because a lot was happening in our family life. Our son was out of high school with no real plan. Our daughter would be starting middle school soon. We decided to move to another state. Our dog developed anxiety and was put on Prozac. And my husband launched a business expansion plan. Suffice it to say it seemed like a good time to be more available for this transitional phase in our world, and it ended up being a wise decision, especially when my husband started traveling every week. Once the kids, dog, and husband settled into their respective grooves it was time for me to get back to work. I got my California Real Estate License, and began working at Windermere SoCal in Carlsbad. I soon discovered my dog did not “get the memo.” Apparently he had grown accustomed to his charmed life, courtesy of you know who. In Dexter’s defense, why wouldn’t he get used to his hour-long morning walks, not to mention thirty minutes in the afternoon and evening. He also quite fancied short rides in the car running errands, truly enjoyed having someone around at all times to freshen up his water bowl, toss him a treat, and randomly scratch his tummy. What’s not to like? Apparently me going back to work is what’s not to like. Being extremely agile he soon began jumping up onto the kitchen counters foraging. We stopped leaving out bowls of nuts, baked goods, etc., and thought the fruit basket was safe, but were wrong. He even figured out how to peel an avocado. I’d be impressed if I was not so annoyed. One day I left an egg next to the stove that I had forgotten to boil and he got it off the counter and onto the living room rug. Unbroken. 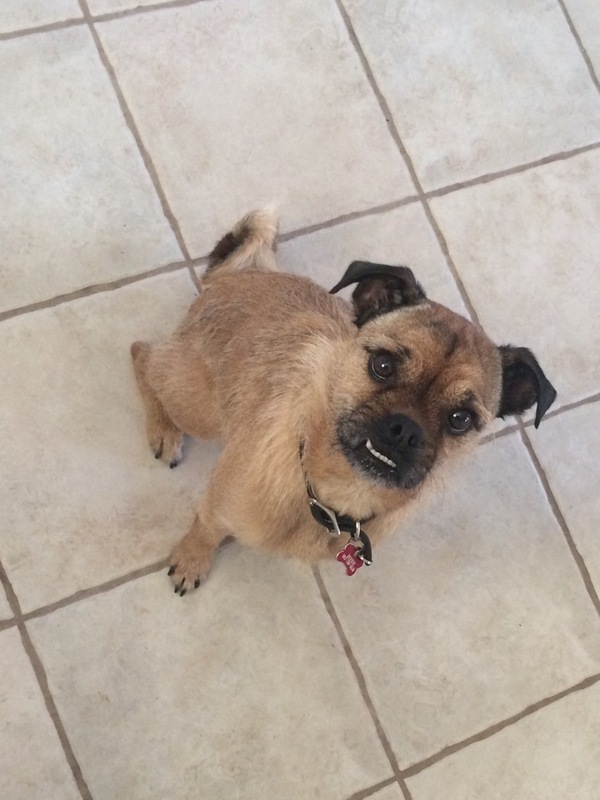 He is a Pug Terrier mix = small mouth. Again, impressive. Next up? Greenies. Small piles of them, half chewed, all over the house. An entire bag, zip lock un zipped . All over the living and dining room rugs. He must have needed a rest mid purge so he also heaved ho on TWO different beds. Variety is the spice of life, after all. Then there was his “escapism period.” We moved to Southern California so we could get more sun and enjoy the breezes so naturally we like to leave the windows open, screens on, of course. Sadly the fear of being alone combined with his terrorist ways and sharp little talons soon got the best of him and he shredded not one, (you’d think we’d learn our lesson) but two second story window screens. The first time he went onto the roof and cruised around until our neighbor Ed got out his ladder and rescued him, the second luckily he did not venture out, as there is nothing but concrete (splat) below. Thankfully frozen Kong’s, a couple new challenging toys, and more bike riding have helped Dexter, and he is doing much better now. I think he finally gets that we will indeed be returning at some point to fill his bowl and scratch his belly, so there is no need for shenanigans. Or so we hope. P.S. Since Ed rescued him, has two dogs of his own, and is a dog lover in general, Dexter fell in love with him. So much so that he visits him whenever he gets the chance, no invitation required. Ed nonchalantly brings him home and we scratch our heads trying to figure out which door, gate or window he got out of this time.